How many pages can I name after Donkey Kong Country levels? (Platform Peril being the other one I’ve done recently.) Well this one’s not exact because “Parrot Chute Panic” doesn’t make a whole lot of sense in this context. Hopefully I’ll be able to get a page up on Friday, but packing is eating us up. At any rate, here’s more music from Lucas!! This one is Lomurcio’s Theme! Poor Derk. This chapter has just NOT been a good time for him. Also, couldn’t Skarvs have just used his cape? The joke was originally that he didn’t want to use his cape because it was undignified, and that capes are for show and not using, etc. but we couldn’t really make it as funny as we thought we could. Understandable! How like him though. My whole Blogspot thing is weird and I’ve been trying to find out how to make it a comic character but hey, I’m sure you all enjoy me with my Baritone Uke. Downloads are free! I also write a bit about each of them in the “Info” section. Enjoy. Skärva: Just generally a nice guy. I think that I prefer this piece to the Temple of Terror theme; as I just said in a comment on the previous page, I kept feeling a discord in that one that reduced my enjoyment of it a little. Overall, this is a fun piece, although I sometimes feel that it’s perhaps a little forceful and adventurous for an aged sage. However, again as I indicated on in my comment on the previous page, I’m pretty tired at the moment, which might be throwing off my sensibilities. Well, definitely feel free to give Lucas feedback since I know he’s reading the comments. Despite being in band for over half my life, my own knowledge of music is rather stunted. XD If it helps, this didn’t start out as Lomurcio’s theme per se, and was just a tune to set the scene at that part of the story when they first met him (and he was explaining the treacherous path to Frostbite Fortress). We could renege on calling this his theme in general. As to the name of the piece, ah, that does make more sense, I think! It’s always food! Sometimes it’s bread, sometimes it’s steak, sometimes it’s just food in general. Poor robots can’t eat. At least not yet. That’s fine that you’re not a musician; most people who critique work aren’t! I prefer people being honest; especially on the technical side of things. I could, for example, write a song that sounds great on my speakers and then you listen to it on your MP3 player and it sounds like garbage. I’d hate that. This is more on the tech side but if there’s something REALLY wrong I want to fix it ASAP on the Bandcamp page. Since this is more about compositions though, as I said on Bandcamp, Courtney’s helped me take off some chains to experimentation; for these songs, most of my critiques come from the readers, so even if I (on Courtney/Victor’s request) don’t go back and redux a track, I am very likely to use the feedback on improving themes in the future. I may go with that suggestion. Character themes confuzzle me but I’ll mess around in FL Studio (the program I use) when I get the chance. Hope this wasn’t too wordy! As Courtney said, I am reading all comments on Twitter or on here. I suppose that one approach to character themes might be to think about the emotions or feelings associated with that character, and use those as a base, then perhaps layer over that something related to the actions that they take. Lomurcio might, as I see him, be associated with age, perhaps a sense of timelessness, wisdom, and being slightly off-putting. On top of that, one might add something suggesting his game-like text-box–perhaps something that sounds like eight-bit music–and something suggesting his work as a sage. 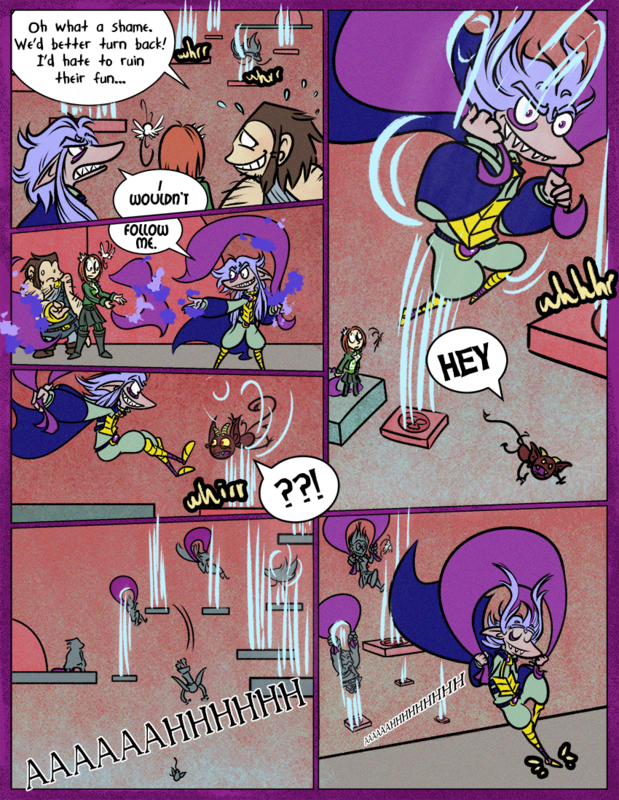 That last panel is wonderful – Skaerva’s billowy hair and cape, the smirk, and the dignified landing! I can definitely see the music track as something like “Lomurcio’s Tent” or possibly a marketplace; I rather like the rhythm of it. Thanks! I believe skarkboy is enjoying himself more than he would admit. Your avatar is also from the first comic where Lomurcio showed up. Just a little coincidence. The Princess seems to be having fun in that last panel! How often does a princess get to parachute through a wind tunnel? Well, of COURSE that, but I also mean like, she’s gleefully unconcerned with Skarva’s intentional punting of the poor castle’s residents. I’m starting to ship Skarva and the Princess in my head, now. Oh PLEASE, I’ve been secretly shipping them in my head since the beginning! Except not really… but the thought has passed my mind. If I could fall off a building only to safely appear on the top, i’d do that over and over and over again! Whoa, you’re absolutely right! That’s exactly what happened. I don’t know how I didn’t catch that… thanks for pointing it out! I’ll fix it tomorrow. I think you’ve forgotten, seeing as “tomorrow” was 10 months ago.